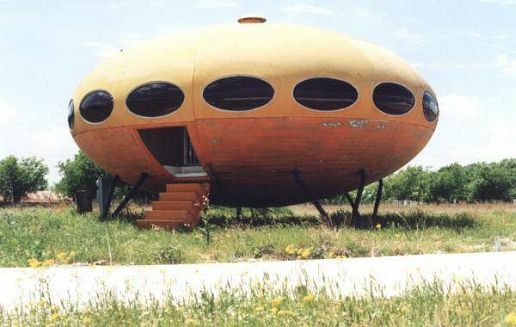 Another Futuro House. This one is located near the intersection of highway 276 and S. Munson Road, not far from Rockwall, Texas. The picture dates from April 2003 .The house seems abandoned. It is commonly accepted that the demise of the Futuro was due to changing fashions and to the high prices oil reached in the early 1970s (which sent the price of plastic skyrocketing). But according to the webmaster of www.futurohouse.com it may well have been the lack of closet space which really turned off most women.